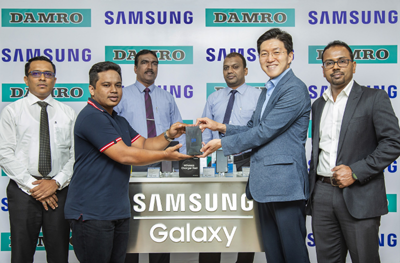 Samsung Electronics Co., Ltd appointed Damro as its latest distributor for Samsung Mobile phone channel, further expanding its network. Samsung has launched a variety of Smartphones over the past month and now the latest Samsung models are available for sale at Damro showrooms island-wide. Damro is South Asia’s largest Furniture Manufacturer and a leading retailer in Sri Lanka for Furniture & Appliances. It has over 240 showrooms globally and 175 island-wide. Damro is already selling Samsung Consumer electronics at its showrooms and is closely associated with the Korean brand. Samsung believes Damro’s existing familiarity with the brand will add value to the sales of Samsung, considering Damro’s island-wide presence; customers will enjoy greater access to Samsung Devices. Leveraging on the popularity of its brand amongst smartphone users in Sri Lanka, Samsung recently unveiled Galaxy Note8, Galaxy S9 and S9 Plus flagship devices, A6, A6+ and A8+ alongside the latest J-Series range – J7 Duo, J4, J6 and J8 aimed at the mid-segment smartphone market across various price points. Demonstrating its commitment to Sri Lanka, Samsung is introducing these mid-segment smartphones to penetrate the market further and empower budget-concerned customers to enjoy the Infinity Display feature on Galaxy J6 and J8 from the flagship Galaxy smartphone series.